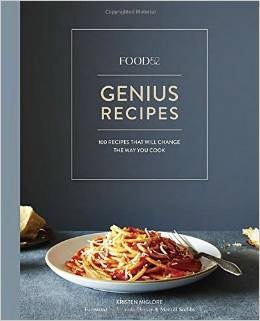 Food52 Genius Recipes: 100 Recipes That Will Change the Way You Cook I love this book! I knew I would love this book. When author Kristen Miglore asked me for a recipe contribution for her weekly "Genius Recipes" posting on Food52, I gave her my "Fresh Blueberry Pie" now also appearing on page 205 of this book, along with the advice that she write a book featuring all of these recipes. And at last, here it is! What a genius concept. Kristen features recipes of renowned food professionals that are not only delicious but also employ one or more brilliantly effective techniques. And she highlights them in a separate section on the recipe page titled "Genius Tip." This is an excellent teaching tool. I have already made several of the recipes that appeared on line in Food52 or in other places such as Marion Cunningham's amazingly ethereal, crisp, and flavorful "Raised Waffles" that she gave me permission to put in the Cake Bible 27 years ago. And now, looking through the gorgeous photos in Genius Recipes, I want to try just about everything. Kristen Miglore is a first rate researcher, writer, and food stylist. Her descriptions, recipe details and explanations of what makes the recipes special are a joy to read. I encourage you to get this book and rush right over to page 102 for Michael Ruhlman's "Rosemary-Brined Buttermilk Fried Chicken." Not only is it the best fried chicken I've ever tasted or made, it is the only one that doesn't spatter grease all over the kitchen floor.